COOPH Field Jackets are now available in two new colorways, ‘Taupe’ and ‘Olive’. From quick-access smartphone pockets to inner and outer compartments, the field jacket offers a variety of storage solutions to keep your camera accessories and daily essentials well within reach. 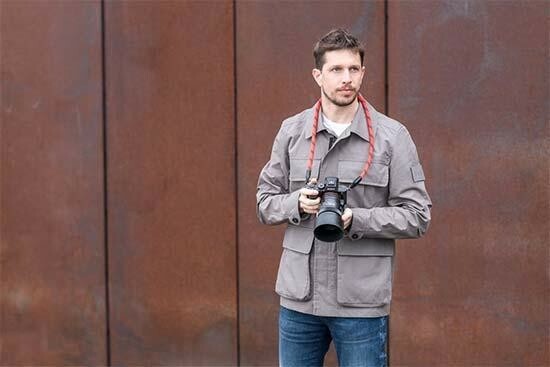 If there’s one thing that a photographer needs, it’s a functional, feature-filled jacket that’s as stylish as it is practical. This is where the COOPH Field Jackets come in - and we’re excited to announce the release of two new colorways in ‘Taupe’ and ‘Olive’. With spring just around the corner, these fresh new pieces are the perfect way to keep your wardrobe in-sync with the season. Sourced from Swiss weaving mill Stotz and handcrafted in Poland, the European-made jackets are constructed from a 100% cotton fabric called EtaProof®, which was formerly worn by British Hurricane pilots during the Second World War. The jacket’s comfortable yet warm material is ideal for fighting off those final cold spells and comes with many useful features to make outdoor photo missions a whole lot easier. From quick-access smartphone pockets to inner and outer compartments, the field jacket offers a variety of storage solutions to keep your camera accessories and daily essentials well within reach. All of this is integrated into a lightweight and breathable garment that combines ease of movement with a stylish, military-inspired design; ensuring you look the part whether you’re out in the field or out on the town. For more information on the COOPH Field Jacket or other COOPH products, visit the COOPH Store – or get in touch to receive product samples for you to check out and feature in your publications. COOPH is a photography apparel and accessories creator and community-focused online mag that recognizes and supports people passionate about photography. It is the very first brand to produce stylish and functional clothing specifically designed with photographers in mind. From our specialized apparel and professional photography workshops to our popular online magazine and videos – everything we do works towards recognizing and supporting the people behind the lens.